In fluid dynamics, the Mach number (M or Ma) (/mɑːk/; German: [max]) is a dimensionless quantity representing the ratio of flow velocity past a boundary to the local speed of sound. By definition, at Mach 1, the local flow velocity u is equal to the speed of sound. At Mach 0.65, u is 65% of the speed of sound (subsonic), and, at Mach 1.35, u is 35% faster than the speed of sound (supersonic). The local speed of sound, and thereby the Mach number, depends on the condition of the surrounding medium, in particular the temperature. The Mach number is primarily used to determine the approximation with which a flow can be treated as an incompressible flow. The medium can be a gas or a liquid. The boundary can be traveling in the medium, or it can be stationary while the medium flows along it, or they can both be moving, with different velocities: what matters is their relative velocity with respect to each other. The boundary can be the boundary of an object immersed in the medium, or of a channel such as a nozzle, diffusers or wind tunnels channeling the medium. As the Mach number is defined as the ratio of two speeds, it is a dimensionless number. If M < 0.2–0.3 and the flow is quasi-steady and isothermal, compressibility effects will be small and simplified incompressible flow equations can be used. The Mach number is named after Austrian physicist and philosopher Ernst Mach, and is a designation proposed by aeronautical engineer Jakob Ackeret. As the Mach number is a dimensionless quantity rather than a unit of measure, with Mach, the number comes after the unit; the second Mach number is Mach 2 instead of 2 Mach (or Machs). This is somewhat reminiscent of the early modern ocean sounding unit mark (a synonym for fathom), which was also unit-first, and may have influenced the use of the term Mach. 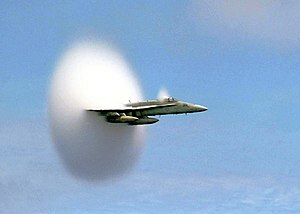 In the decade preceding faster-than-sound human flight, aeronautical engineers referred to the speed of sound as Mach's number, never Mach 1. The speed of sound (blue) depends only on the temperature variation at altitude (red) and can be calculated from it since isolated density and pressure effects on the speed of sound cancel each other. The speed of sound increases with height in two regions of the stratosphere and thermosphere, due to heating effects in these regions. Mach number is useful because the fluid behaves in a similar manner at a given Mach number, regardless of other variables. As modeled in the International Standard Atmosphere, dry air at mean sea level, standard temperature of 15 °C (59 °F), the speed of sound is 340.3 meters per second (1,116.5 ft/s). The speed of sound is not a constant; in a gas, it increases as the absolute temperature increases, and since atmospheric temperature generally decreases with increasing altitude between sea level and 11,000 meters (36,089 ft), the speed of sound also decreases. For example, the standard atmosphere model lapses temperature to −56.5 °C (−69.7 °F) at 11,000 meters (36,089 ft) altitude, with a corresponding speed of sound (Mach 1) of 295.0 meters per second (967.8 ft/s), 86.7% of the sea level value. 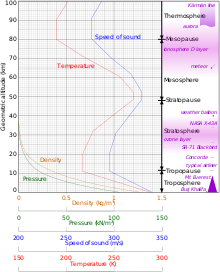 While the terms subsonic and supersonic, in the purest sense, refer to speeds below and above the local speed of sound respectively, aerodynamicists often use the same terms to talk about particular ranges of Mach values. This occurs because of the presence of a transonic regime around M = 1 where approximations of the Navier-Stokes equations used for subsonic design no longer apply; the simplest explanation is that the flow around an airframe locally begins to exceed M = 1 even though the freestream Mach number is below this value. Meanwhile, the supersonic regime is usually used to talk about the set of Mach numbers for which linearised theory may be used, where for example the (air) flow is not chemically reacting, and where heat-transfer between air and vehicle may be reasonably neglected in calculations. In the following table, the regimes or ranges of Mach values are referred to, and not the pure meanings of the words subsonic and supersonic. Generally, NASA defines high hypersonic as any Mach number from 10 to 25, and re-entry speeds as anything greater than Mach 25. Aircraft operating in this regime include the Space Shuttle and various space planes in development. The subsonic speed range is that range of speeds within all of the airflow over an aircraft is less than Mach 1. The critical Mach number (Mcrit) is lowest free stream mach number at which airflow over any part of the aircraft first reaches Mach 1. So the subsonic speed range includes all speeds that are less than Mcrit. 0.8–1.3 530–794 609–914 980–1,470 273–409 Transonic aircraft nearly always have swept wings, causing the delay of drag-divergence, and often feature a design that adheres to the principles of the Whitcomb Area rule. The transonic speed range is that range of speeds within which the airflow over different parts of an aircraft is between subsonic and supersonic. So the regime of flight from Mcrit up to Mach 1.3 is called the transonic range. 1.3–5.0 794-3,308 915-3,806 1,470–6,126 410–1,702 The supersonic speed range is that range of speeds within which all of the airflow over an aircraft is supersonic (more than Mach 1). But airflow meeting the leading edges is initially decelerated, so the free stream speed must be slightly greater than Mach 1 to ensure that all of the flow over the aircraft is supersonic. It is commonly accepted that the supersonic speed range starts at a free stream speed greater than Mach 1.3. Aircraft designed to fly at supersonic speeds show large differences in their aerodynamic design because of the radical differences in the behaviour of flows above Mach 1. Sharp edges, thin aerofoil-sections, and all-moving tailplane/canards are common. Modern combat aircraft must compromise in order to maintain low-speed handling; "true" supersonic designs include the F-104 Starfighter, SR-71 Blackbird and BAC/Aérospatiale Concorde. 10.0–25.0 6,615–16,537 7,680–19,031 12,251–30,626 3,403–8,508 The NASA X-43, at Mach 9.6 is one of the fastest aircraft. Thermal control becomes a dominant design consideration. Structure must either be designed to operate hot, or be protected by special silicate tiles or similar. Chemically reacting flow can also cause corrosion of the vehicle's skin, with free-atomic oxygen featuring in very high-speed flows. Hypersonic designs are often forced into blunt configurations because of the aerodynamic heating rising with a reduced radius of curvature. The obvious result is that in order to accelerate a flow to supersonic, one needs a convergent-divergent nozzle, where the converging section accelerates the flow to sonic speeds, and the diverging section continues the acceleration. Such nozzles are called de Laval nozzles and in extreme cases they are able to reach hypersonic speeds (Mach 13 (15,926 km/h; 9,896 mph) at 20 °C). qc is the dynamic pressure measured behind a normal shock. 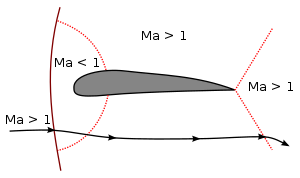 As can be seen, M appears on both sides of the equation, and for practical purposes a root-finding algorithm must be used for a numerical solution (the equation's solution is a root of a 7th-order polynomial in M2, and by the Abel-Ruffini theorem, it is not possible to determine M in closed form). It is first determined whether M is indeed greater than 1.0 by calculating M from the subsonic equation. If M is greater than 1.0 at that point, then the value of M from the subsonic equation is used as the initial condition for fixed point iteration of the supersonic equation, which usually converges very rapidly. Alternatively, Newton's method can also be used. ^ a b Young, Donald F.; Bruce R. Munson; Theodore H. Okiishi; Wade W. Huebsch (2010). A Brief Introduction to Fluid Mechanics (5 ed.). John Wiley & Sons. p. 95. ISBN 978-0-470-59679-1. ^ a b Graebel, W.P. (2001). Engineering Fluid Mechanics. Taylor & Francis. p. 16. ISBN 978-1-56032-733-2. ^ Bodie, Warren M., The Lockheed P-38 Lightning, Widewing Publications ISBN 0-9629359-0-5. ^ Nancy Hall (ed.). "Mach Number". NASA.